Why is there foam in a cooling tower? Is it a problem or good news? 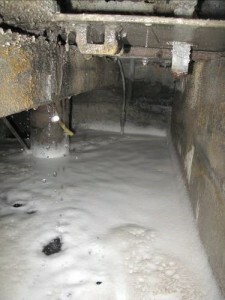 AMSA, Inc.BlogWhy is There Foam in My Cooling Tower? 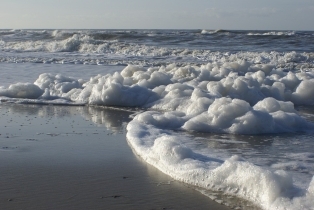 Foam generation is a common natural aquatic phenomenon, occurring in lakes, rivers and throughout the world’s oceans. 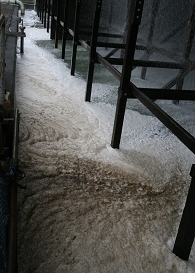 Natural foams formed at a waterfall (left), and at the seashore. Foam formation requires the presence of a surface active agent (surfactant) to reduce surface tension at the air-water interface. It also requires the input of mechanical energy to mix air into the water. 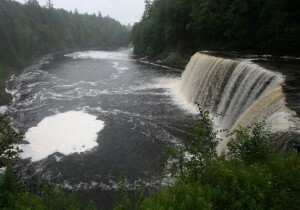 In natural environments this mechanical mixing energy might result from wave action, wind action, currents or a waterfall. Surfactants occur in natural aquatic environments in the form of fatty acids, proteins and lipids, supplied by living and decaying algae and other aquatic organisms. These materials accumulate in the “surface micro-layer” which forms at the air-water interface in all waters, natural and industrial. This occurs due to the natural buoyancy of these chemicals, aided by the action of gas bubbles rising to the water surface. A water system’s surface micro-layer is enriched in dissolved organic matter, particulate organic and inorganic solids and microorganisms, components which will promote foam formation and stabilize the foam. “Clean” natural foams are generally white to light tan in color. Foams formed in highly colored waters (e.g., with high humic acid content) or water with high levels of particulate solids will take on the color of the dissolved and/or suspended solids in the water. Why do some cooling towers generate foam? Cooling towers are, by design and operation, susceptible to foaming. The water is treated with a variety of organic chemicals, some of which have surface active properties. The tower draws in a continuous flow of air, bringing with it a variety of particulate and vapor contaminants from the surrounding environment. Heat exchanger piping leaks can allow contamination of the cooling water with process fluids which may include surfactant-type chemicals and/or may promote bacterial and algal growth. Bacterial and algal growth and surface fouling will generate surfactants, similar to natural environments. And, the cascade of water from the bottom of the tower packing to the surface of the water in the basin provides the mechanical energy required for foam formation. Hence, many cooling towers will produce a small to a moderate amount of foam, depending on water chemistry, treatment chemicals and the presence of biofouling (algal and bacterial) supplying natural surfactants. 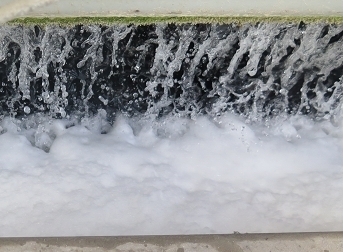 Frothy foam in a semi-closed loop sump (left), and in a cooling tower basin. What happens when you treat a cooling tower with a cleaner/dispersant such as BCP™ 1000/2000? When a relatively clean cooling tower is treated with BCP™ 1000/2000 series products, the amount of foam in the tower may increase slightly and the consistency of the foam may increase from frothy to slurry-like (thicker) due to the surfactant properties of the products (see below). 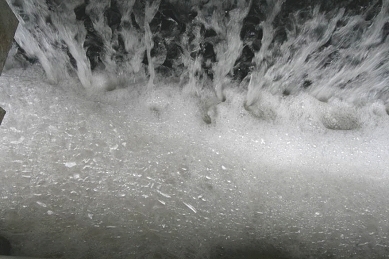 The foam generated in a relatively clean system is white to light tan in color, contains little or no particulate material, and breaks without the use of antifoam. This is what might be expected when using BCP™ 1000/2000 series products in continuous, maintenance treatment mode. 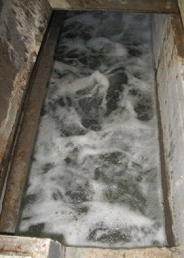 Thicker slurry-like clean foam in a semi-closed loop sump (left), and in a cooling tower basin following BCP™ 1000/2000 treatments. When a cooling tower with significant biofouling is treated with BCP 1000/2000 products, the amount of foam in the tower basin will increase substantially due to release and dispersion of bacterial/algal biofouling deposits containing natural surfactants. Particulate matter in the form of dispersed biomass, corrosion products and other inorganic deposit debris will be entrained in, and visible in the foam. The presence of these particulate solids will stabilize the foam, giving it a thick-and-creamy, slurry-like appearance rather than thin-and-frothy appearance. 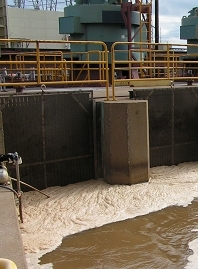 Color of the foam will reflect the type of deposits in the system, and may be dominated by specific corrosion products. 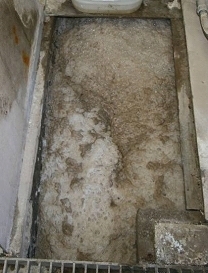 Slurry-like foam carrying significant fouling deposits removed during treatment with BCP 1000/2000 products; semi-closed loop sump (left), fossil fuel power plant cooling system basin (center), geothermal power plant cooling tower basin (right). A problem or good news? So, you’ve treated your system with BCP 1000/2000 and you see more foam than usual. Is that good news, or bad news? If you see significant foam in your cooling tower following treatments with BCP 1000/2000 products, the good news is that it indicates deposits are being removed from all surfaces, including critical heat exchanger surfaces, throughout the cooling system. Eventually this foam will break, and the entrained solids will return to the bulk water where they can be removed with blowdown or by filtration. If either the amount and/or stability/longevity of the foam produced following BCP 1000/2000 treatments presents a problem, a small amount of silicon-based antifoam/defoamer can be used to manage this foam. Many regular users of AMSA’s BCP 1000/2000 products rely on the appearance of foam in their tower basins to know when they’ve hit the dosing “sweet spot” for cleaning action in their system. For these users, slurry-like foam in the tower basin means biofouling deposits are being removed from their systems, and that’s great news! My brother recently purchased a property with a cooling tower. He has been worried lately because he has found a lot of foam building up, so he’s looking for information that can help him increase the longevity of the structure. I didn’t realize foam formation is a normal phenomena when a surface agent reduces the surface tension allowing air into the water. I’ll be sure to share this information with my brother. It’s interesting that water in cooling towers is susceptible to foaming because of all of the chemicals they treat the water with. I’m thinking about taking a job working at a waste heat facility. I suppose it would be good to know that the foam in the water is normal and not the result of a problem.